When you hear the jingles in the stores and see the decorations on your neighbor’s house, you know that the holiday season has arrived. Among other traditions, you can also expect food to play a big part of the holiday, whether it’s snacks for a party or a big family dinner. Unfortunately, a lot of traditional holiday food can be harmful to your teeth, from sticky candy canes to sugary, maybe alcoholic eggnog. Thankfully, there are also lots of seasonal dishes and treats that can keep your smile as healthy as ever. You probably already have a sizable list of foods you know to be bad for your teeth: soda, coffee, and candy. However, what about the crackers you set out as hors d’oeuvres? Even without extra-sweet ingredients added in, bread and related snacks are full of carbohydrates – that is, sugar – and their crumbly, dissolvable nature means that these bacteria-feeding carbs get stuck to your teeth. Alcohol, not counting the sugar it is often made of or mixed with, will dry out your mouth; dry mouths are the perfect environment for bacteria. Even the cough drops you take for colds and the flu not only have sugar in them, but also expose you to that sugar over a long period of time. Cough syrup, despite having similar amounts of sugar in it, is quickly swallowed and doesn’t expose the teeth to that sugar too long. Simply put, too many holiday edibles encourage the decay of your teeth. Not to worry! Lots of holiday foods diminish, if not reverse, the damage other foods can do. Two common party snacks, for example, are meat and cheese. The calcium and proteins provided by meat and cheese can actually strengthen your teeth and gums. Nuts, like meat, also provide your mouth with a burst of protein and saliva production that help defend your teeth from bacterial build-up. Instead of sweetened cranberry sauce in your dishes, try using fresh cranberries; they can interrupt the bonding process of the decadent bacteria. Though dried fruit is a bad idea, crunchy fruit and raw vegetables can help scrub plaque off of your teeth. The holidays and their traditions are fast approaching. If you eat too much of the wrong kinds of traditional foods, or you find yourself chewing on that food for a long period of time, your teeth can suffer. However, holiday tradition have also given us a lot of food to protect and strengthen our teeth as well. So, when planning out the next holiday party or dinner, keep these foods in mind. They may just save your smile. Periodontal disease, known as gum disease or periodontitis, is one of the most common causes of tooth loss. In the United States, it is estimated that half of Americans aged 30 or older have advanced gum disease. While highly prevalent, this dental condition is preventable with a good oral health regimen. Periodontal disease symptoms become apparent as bacteria and debris accumulate around teeth and below the gum line and hardens into tartar. If not removed by a professional, tartar and bacteria can cause inflammation of the gums and weakening of teeth. There are variables that can increase your risk of periodontitis that range from genetic predisposition and underlying health conditions, to certain lifestyle habits. Diet, taking certain medications, decreased immunity, and hormonal changes can also increase your chances of developing gum disease. Periodontitis begins with the onset of gingivitis. In this early stage, bacteria builds up, irritating the surrounding gums. As bacteria accumulate and plaque builds and hardens into tartar, there is a weakening of bone and connective tissue that keeps teeth in their sockets. As bacteria spreads, pockets that trap further bacteria begin to form around teeth and under soft tissue. In patients with advanced periodontal disease, teeth become loose and fall out. Diagnosis of gum disease typically involves visiting a dentist for a visual examination of your oral condition, as well as charting pocket depths and using X-Rays to check bone loss in areas with deeper periodontal pockets. Early diagnosis gives patients the greatest chance of reversing damage with nonsurgical treatments. These procedures include root scaling and planing, which removes tartar and bacteria from surfaces of teeth and beneath the gums and smooths root surfaces,. Antibiotics that are either taken orally or topically as a rinse, can also be used to reduce bacteria and inflammation. For patients with advanced periodontitis, dental surgery may be the most effective option to reduce pocket size and restore the healthy appearance and supportive structure of soft tissue. Periodontal disease is preventable by practicing consistent and good oral hygiene. As a rule of thumb, you should be taking between 3-5 minutes twice day to care for your teeth and gums by flossing first to loosen any food particles and bacteria, and brushing to clean all surfaces of teeth. You should also visit your dentist twice a year for thorough teeth cleanings. Patients displaying early signs of gum disease may require more frequent dental visits throughout the year. If are exhibiting signs and symptoms of gum disease, you should contact your dentist as soon as possible. The sooner you can receive treatment, the more likely you will be able to reverse any damage caused by periodontal disease. 1) Pick the right brush that fits your needs – Not all toothbrushes were created equal. Between varying sizes, bristle strengths, and the recommendations given to you from your favorite dental care provider, there are plenty of options to choose from. 2) Master the technique – Brush your teeth at gum line using a 45-degree angle. Gently move your toothbrush back and forth in short motions, cleaning the outer surfaces of your teeth. Move your brush in gentle up and down motions to clean the inner surfaces of your teeth. Then be sure to brush your tongue! 3) Take your time – Follow the “2 minutes x 2 times per day” rule. 4) Don’t overdo it – Ever hear of having too much of a good thing? Overbrushing can cause dental issues such as wearing down the enamel on your teeth or receding gums. 6) Let it go – Make sure to replace your toothbrush every three to four months or when you start seeing frayed bristles. Also, if you’ve been sick, think about throwing out the old one and replacing it with a new brush. By practicing proper dental care daily, we minimize the risk of cavities and developing other dental health related issues. To make an appointment with your Huntersville dentist, Dr. JC Duncan, call us today at (704) 948-1300. 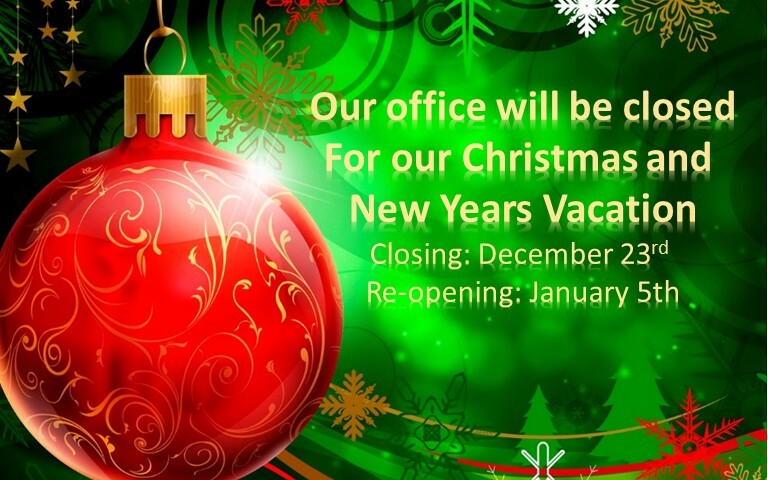 The office of J.C. Duncan will be closing, December 23rd at 2:00pm and will re-open January 5th at 7:30am. To all our valued patients, if you experience a dental emergency during our holiday vacation, please call our office for further instructions. Nothing is worse than being a headache sufferer. Let’s face it. Headaches can be debilitating. There you are, trying to accomplish the zillion things you need to do, only to be knocked down by a crippling headache. All your well planned intentions hindered by the unplanned onset of pain and discomfort, making it impossible for your to complete all those task. Does this sound like you? Headaches come in various types: you could experience a tension, migraine, sinus, and cluster headaches. Although most headaches are temporary and mild, some people experience headaches frequently and require a visit to the doctor for pain relief. The most common cause of headaches is a stress headache. A stress headache is produced from prolonged stress and tension. This stress and tension causes muscle-contraction in your scalp, neck and face to tighten and contract. This in turn causes spasms and pain. What if I told you that I might have away to help? Real headache medicine with out the side effects of medications. With advancements in dentistry, their is now a system that can help relieve you of the constant headaches. The TruDenta system has been designed to get to the bottom cause of the headaches rather than treat the symptoms. TruDenta is designed to treat the cause. It’s time to talk with Duncan Dental to set up a simple painless screening test to see if TruDenta is right for you! Our contest will be coming to an end soon this month. Just a friendly reminder if you haven’t already entered to win, you have 13 days remaining before we will be picking our winner. Read below on how to enter our contest. With the holidays quickly approaching, the office of J.C. Duncan DDS FAGD would like to keep the contest fun running for all our patients. 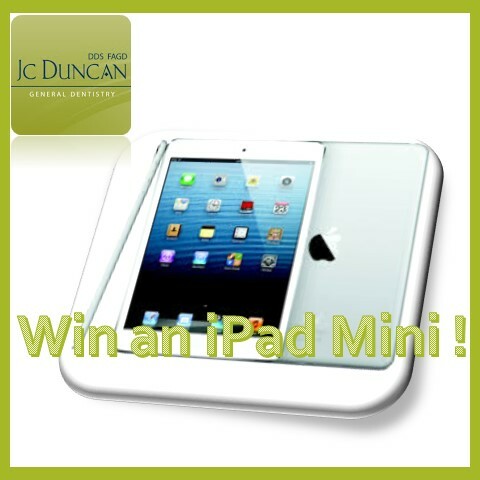 What better time of year to give-a-way a FREE iPad Mini? The lucky winner will be picked just in time for the Christmas holiday. We love running contest and keeping our patients involved. 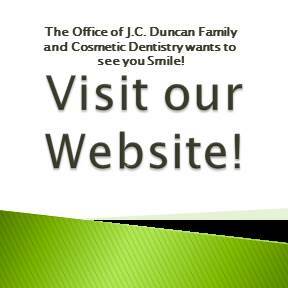 We, at the office of J.C. Duncan DDS FAGD, just want to make you smile. We want to keep the rules simple. Beginning October 1st and ending December 23rd, the office of J.C. Duncan DDS, FAGD, will enter each NEW person who LIKES our Facebook page and all our patients that keeps their scheduled appointments at our office. On December 23rd, Dr. Duncan will dig into his bowl of entries and pick our lucky winner. Already on Facebook? That’s OK. Just like any 3 post and we will enter you in! It’s that simple. 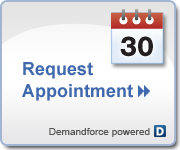 Keep your scheduled appointments at our office between October 1st and December23rd. Already LIKED our Page? Like any three post on the page and get entered to win. Acid reflux or GERD has become a common problem with many people. With long work days, crazy schedules and constantly being on the go, the problem seems to be affecting more and more people every day. What many people don’t think about, as heartburn seems to be a common phenomena, is that the cause of heartburn is from acid and that acid can effect their teeth. What Is Acid Reflux or GERD? What Causes Acid Reflux of GERD? There are many things that can attribute to the onset of acid reflux or GERD. One of the most common causes is a hiatal hernia. Having a hiatal hernia can allow acid to move up into your esophagus inducing symptoms of heartburn. How Can Acid Reflux or GERD Affect my Teeth? 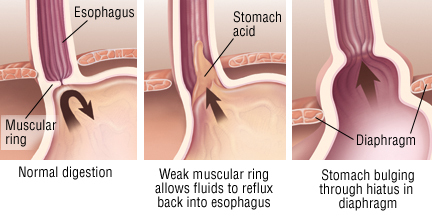 As you read earlier, acid reflux or GERD symptoms not under control can travel stomach acid up your esophagus and into the back of your mouth. Once stomach has reached your mouth it has the potential to create much damage to your teeth. To put this into perspective, pH level measures the acidity of a substance on a scale of 0-14. The lower the number the higher the concentration of acid in the substance. Stomach acid provides a pH level of 2.0. The pH level needed to erode dental enamel is 5.5. This makes stomach acid a big concern for the health of your teeth. If you feel you are suffering from regular heartburn, please talk about it with Dr. J.C. Duncan during your next dental visit. There are many life style changes or medication available to help control acid reflux or GERD symptoms. Our goal is to make sure we keep you and your teeth healthy. Your dentist is part of your medical team to keep you smiling and healthy. The office of Duncan Dental is a certified Invisalign Provider. Invisalign is the clear braces alternative to the metal braces most people are familiar with. It’s simple. They are nearly invisible. When wearing traditional braces most people tend to be self conscious of their appearance. Invisalign clear braces puts an end to all that. The clear braces provides an invisible, removable and comfortable aligner that provides a more attractive smile. 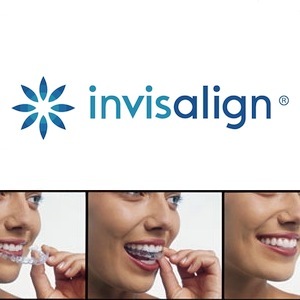 How Does Invisalign Work ? 1. First step is to schedule an appointment with J.C. Duncan to see if you are a candidate for clear braces. 2. If you are deemed a candidate, we will then schedule an appointment to have you fitted for a custom made series of aligners. These aligners are designed for you and you alone. 3. Invsalign works by gently shifting your teeth into place based on the exact movement Dr. Duncan plans out for you. They simply pop in and will be changed out approximately every two weeks until your treatment is complete. The office of J.C. Duncan Family and Cosmetic Dentistry is always looking for ways to protect your child’s teeth and support our community. 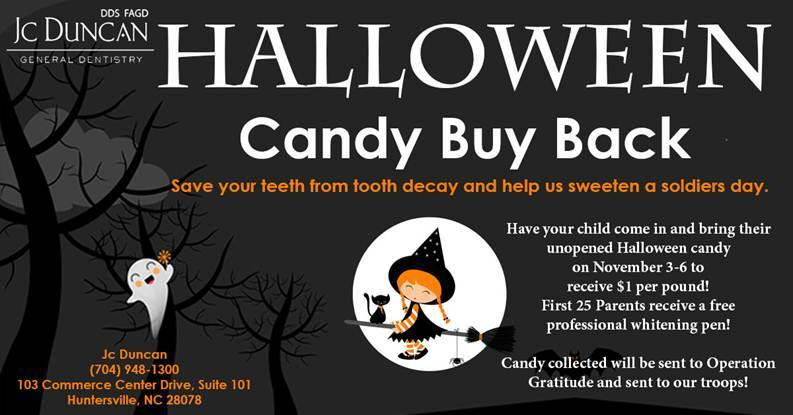 Have your child come into our office and bring their unopened Halloween candy to receive $1.00 per pound for their donation. All candy collected will be sent to Operation Gratitude. All candy collected will be sent to our troops. The first 25 parents to bring in their children will receive a FREE professional whitening pen! In addition to the Halloween candy, you or your child can send letters/cards to the troops that can be included with the candy in the care package. Backyard fun with family and friends are what most people look forward too in the good weather. Cookouts, sitting on your patio sipping ice tea are just a few of the benefits of warm summer days. And when your hot, and the heat becomes unbearable, there is nothing better than a refreshing dip in the pool to bring your body temperature down to normal. Now, with all the things that filter through your mind as your floating on your tube, I’m sure thinking about your teeth is probably the furthest thing from your mind. With so many things to worry about to stay in good health, here is another tidbit to keep in mind the next time you take a dip in the pool. A New York University College of Dentistry study showed that pool water that is too acidic can erode the enamel on your teeth very rapidly. What is a too acidic? A pool containing a pH balance below 7. A properly regulated pool will have a pH level between 7.2 and 7.8. Now for those of you who are fortunate enough to have your own pool in the backyard, it is important to test your pools pH level weakly. 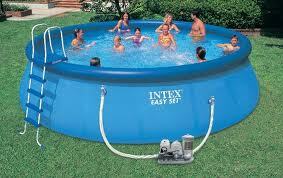 A pool with a low pH balance can be affecting your teeth and your families teeth without you even knowing it. Your enamel protects your teeth and with it being eroded, this opens your mouth up to an array of dental problems. Be proactive, avoid this issue by simply buying pH strips at your local pool supply store and test your pool regularly.